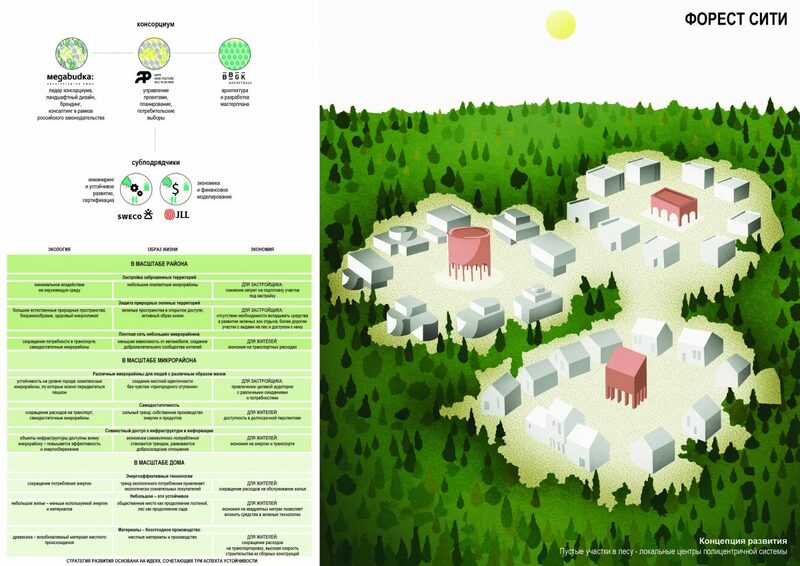 Together with Megabudka, BBGK Architects, SWECO and JLL we have developed a submission for an international competition for the development of concept and masterplan for the eco-district city of Kazan, Republic of Tatarstan in Russia. Russian branch of JLL – financial advisor of the masterplan. 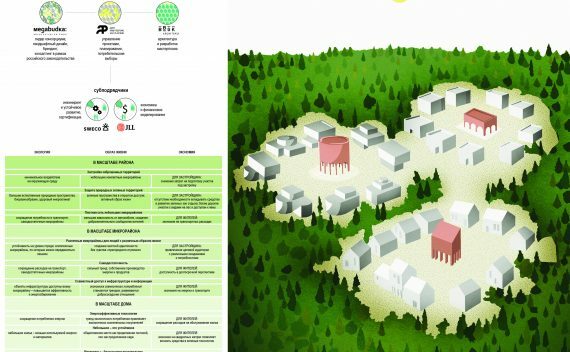 The ‘FOREST CITY’ proposal was built upon the natural potential of Kirovsky district to become a true green urban neighbourhood. Taking advantage of an existing asset, the forest, helps to manage climate change in the area. Forest improves air quality, accumulates water, protects from sun and wind, absorbs CO2 and provides biodiversity. It is the source of renewable construction material and fuel – wood. The forest also helps combine individual aspirations of the residents with the green living trends. The main sustainability principle was to preserve natural green areas and locate new development in the brownfields of the former artillery base. Empty plots – remnants of the military function – have a potential to become local centres of the polycentric layout. Each of these neighbourhoods can have its central feature: either a public facility or a public space. Minimum intervention in the forest and leaving the brownfields to be developed by individual house owners reduces the cost of preparation of the site. It also provides an additional benefit for buyers – a possibility to have their own private bit of the forest. 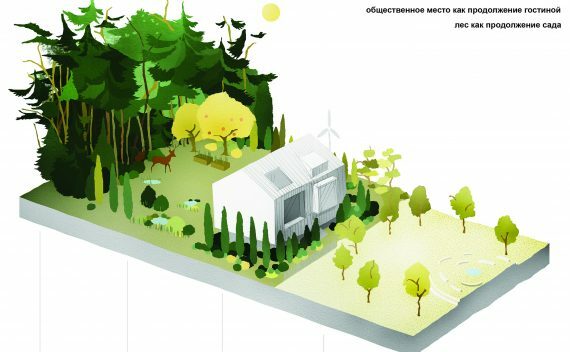 Following the small living trend, the FOREST CITY project assumed explorations within flexible and smart house design, where multifunctional spaces lead to reduction in unit sizes and let the savings be spent on energy-efficient technologies. 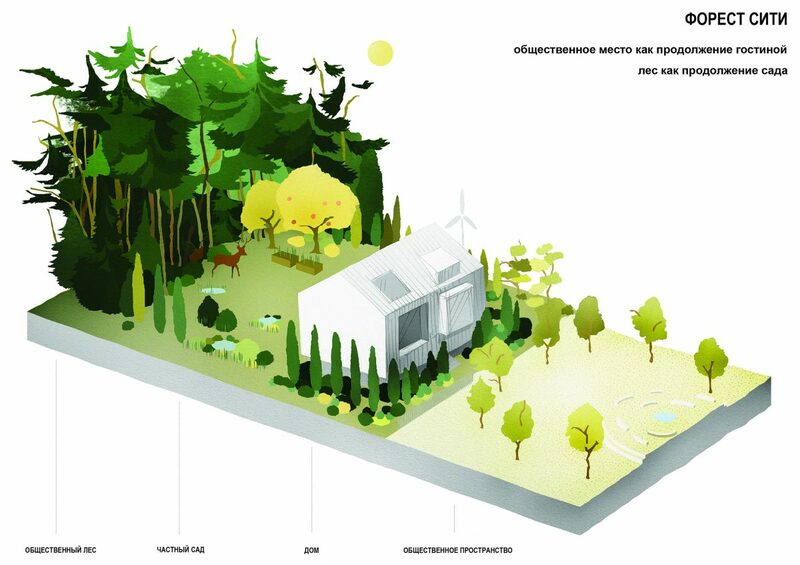 Public space becomes an extension of a house and a forest – an extension of a garden. Sharing infrastructure also allows maintain energy-efficiency, low cost and comfort of living (ie. through local sewage treatment and heating plants).